Sometimes you find a UK day out that’s so awesome it makes you proud to be British. 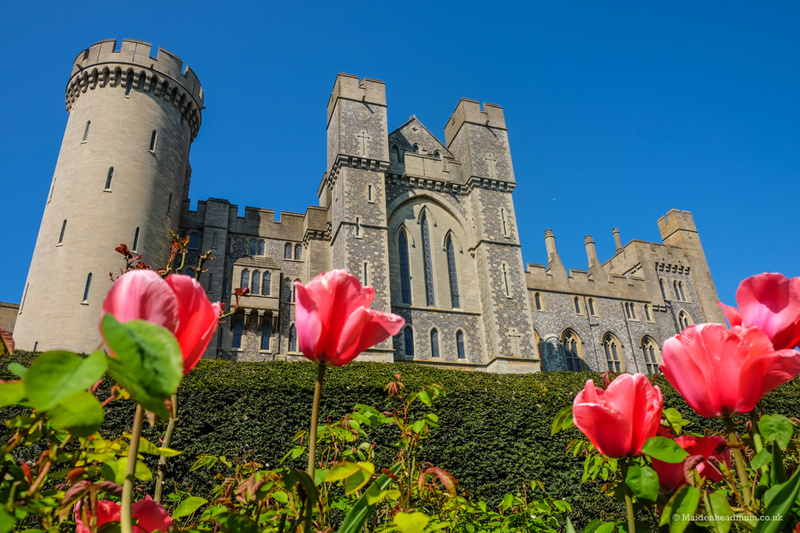 The Tulip Festival at Arundel castle was one of those days for us. We visited as a family during our week-long Easter break in April 2017, and we’re planning our second visit at Easter this year. 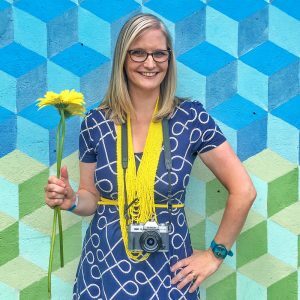 It’s such a gloriously photogenic and family-friendly day that I thought it would be helpful to share some more information here on the blog. Bright blue skies, glorious architecture and a lot of photogenic tulips. 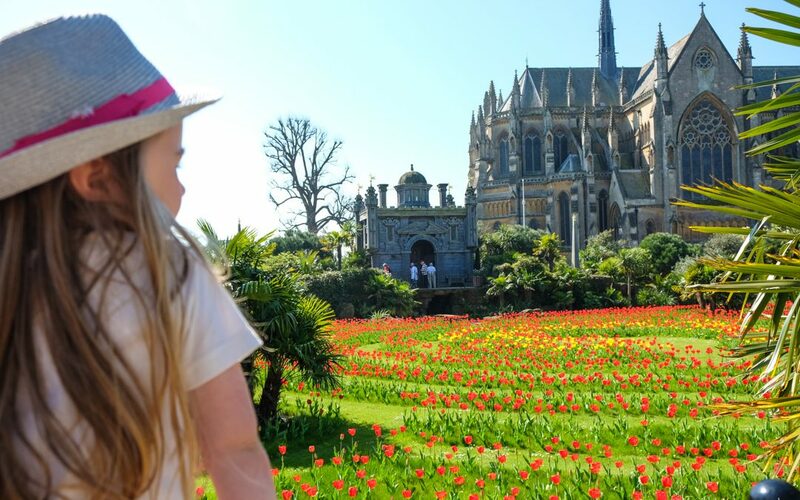 I did a little ‘happy dance’ in my head at the Tulip Festival at Arundel Castle. Ok, so first things first, whenever anyone recommends a place I need to get my bearings. 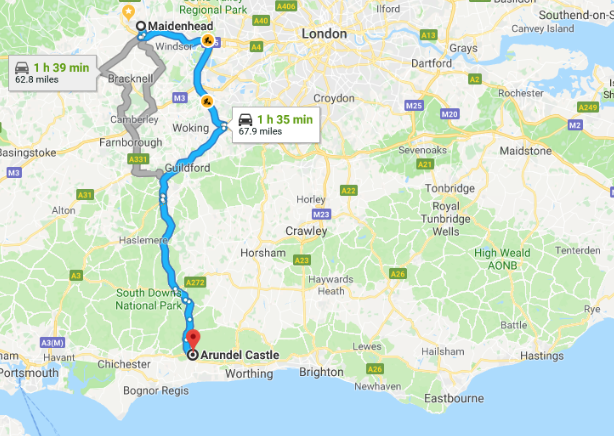 Arundel castle is in West Sussex just at the end of the South Downs, pretty much half way in between Portsmouth and Worthing. If you wanted to do a day trip from Maidenhead, Google maps quotes it as around an hour and a half, which isn’t completely impossible but is a little bit more than I would want to do with my two little ones. 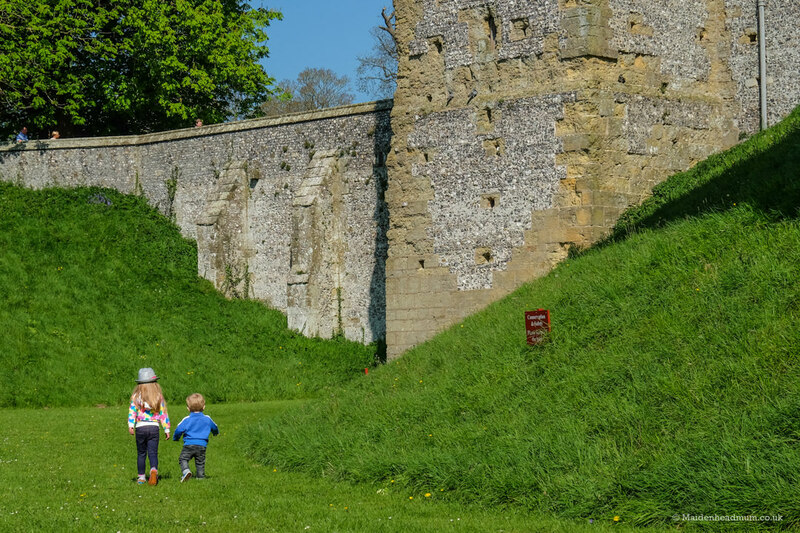 When we visited, we were staying at a holiday park in Pagham which was around 30 minutes drive away from Arundel Castle. I’ll write more about the privately owned caravan we stayed in another time, but it was the perfect base for our family, and it was booked through a local lady in the Maidenhead Gossip Girls Facebook group! 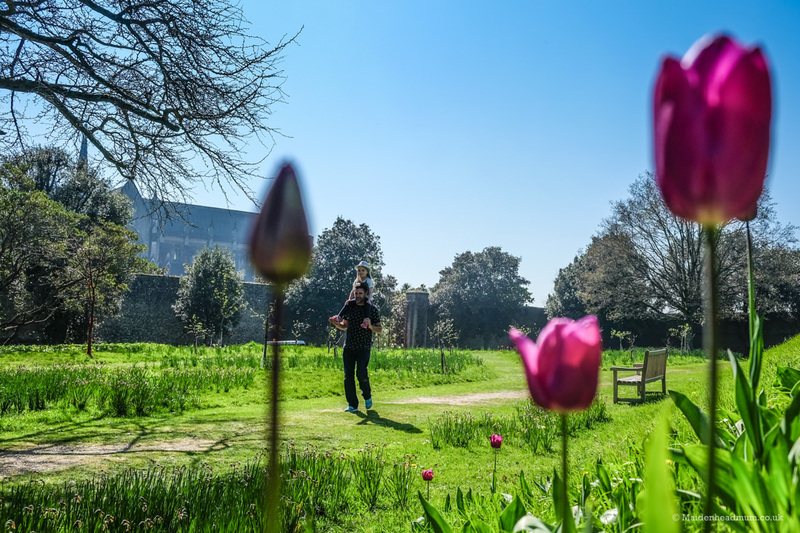 The castle itself is a mixture of an ancient Norman castle and a stately home and gardens which is still inhabited today. 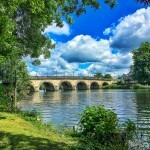 It has been the seat of the Duke of Norfolk and their ancestors for over 850 years. A lot of the castle was damaged during the English Civil War but was rebuilt and restored in the following years. The main restoration work was carried out by the 15th Duke of Norfolk which was completed in 1900. 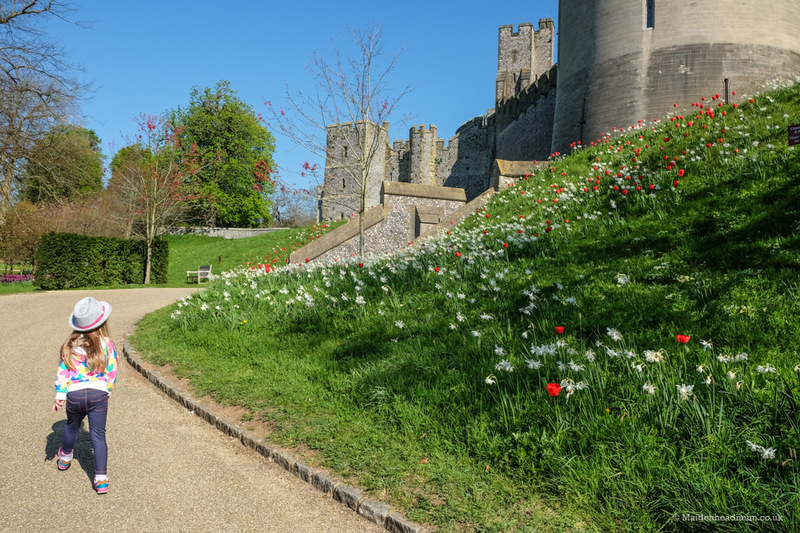 Although Arundel castle looks very traditional, it was actually one of the first English houses to have electric lighting installed. 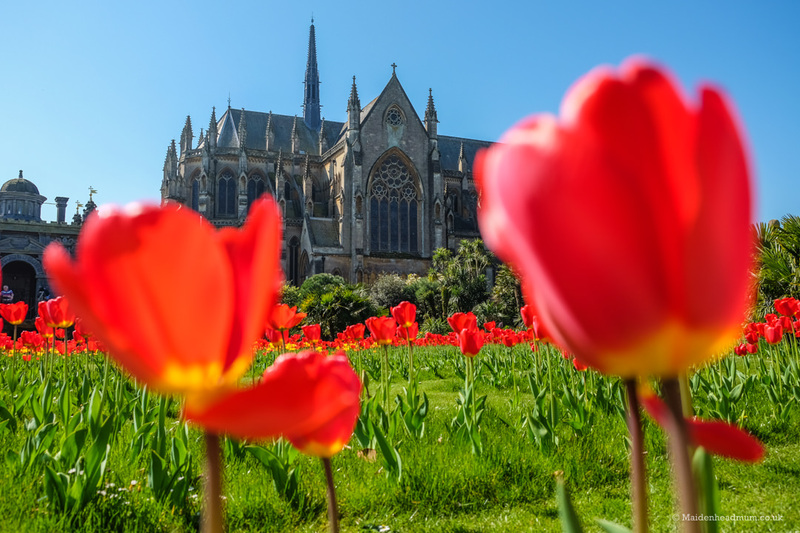 The neighbouring Arundel cathedral which was completed in 1873 is also pretty impressive and is said to be one of the finest examples of gothic revival architecture. At the top of the keep we saw some Knights battling. Although he was little, he enjoyed walking around the castle. Peeping out at the view down below. Look how thick those castle walls are! 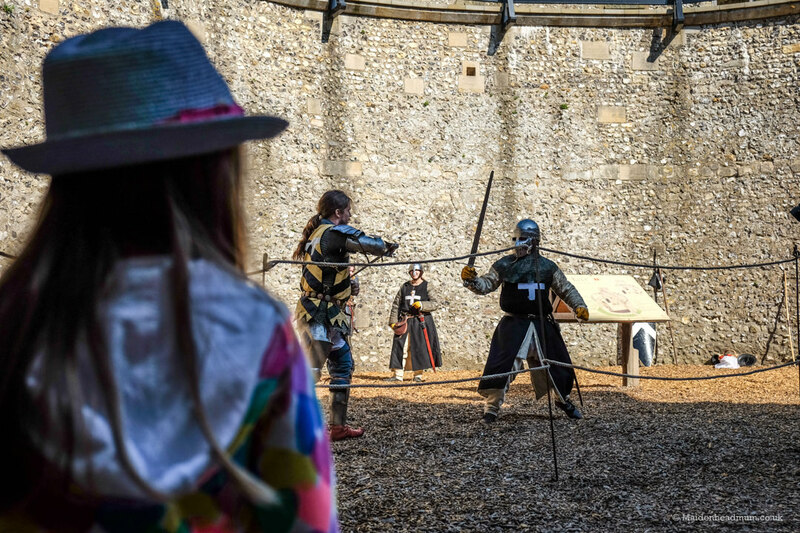 If you’re looking to inspire your kids with a bit of history, then Arundel castle is a great start. Its mixed heritage means that you can get the both of worlds. 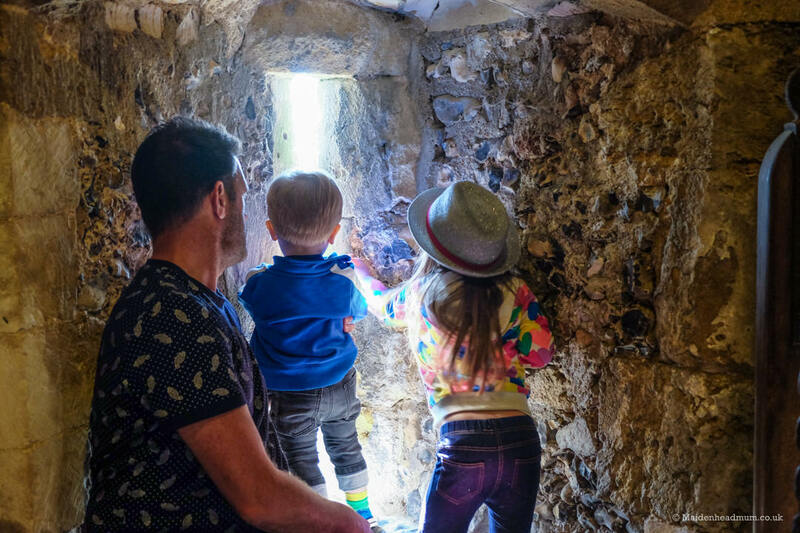 You can imagine firing at the approaching enemy through the slits in the wall of the Norman keep, but you can also get your children to imagine what it’s like to actually live in a castle by visiting the bedrooms and other areas around the castle. 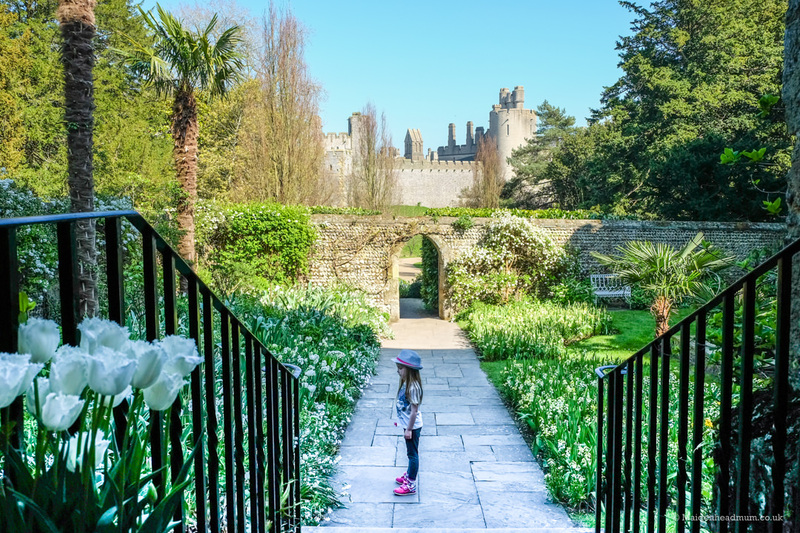 We arrived early at Arundel castle and it was great fun exploring before the crowds arrived. There were lots of places to explore in the grounds. My daughter is trying her best to ‘look after’ her little brother, but at that age you couldn’t really convince him to do anything unless he really wanted to. My 5 year old was excited to see inside the castle. It has a real fairytale appearance. It was so picture perfect it felt worthy of being in a Disney film! 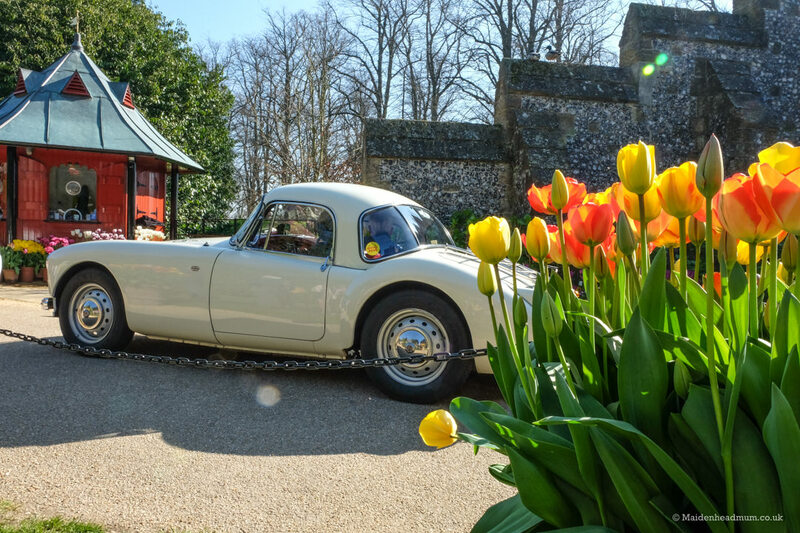 There are different displays all through the year in the grounds of Arundel Castle. The gardens surrounding the castle are stunning, and that’s said by someone that would class themselves as ‘not really into gardening’. (You might like to read my experiences as a non-gardener visiting the Chelsea Flower Show). 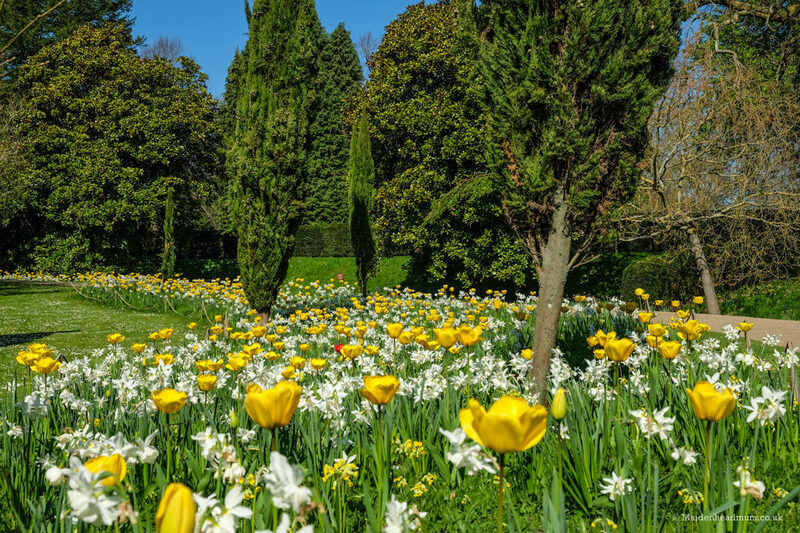 There were yellow and white tulips alongside the paths. 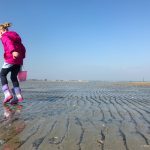 My daughter loved being given the freedom to explore ahead of us. She found her very own ‘house’! And she found things to sit on, to look behind and to hide inside. Good Times. The tulips were gorgeous in the bright sunlight. 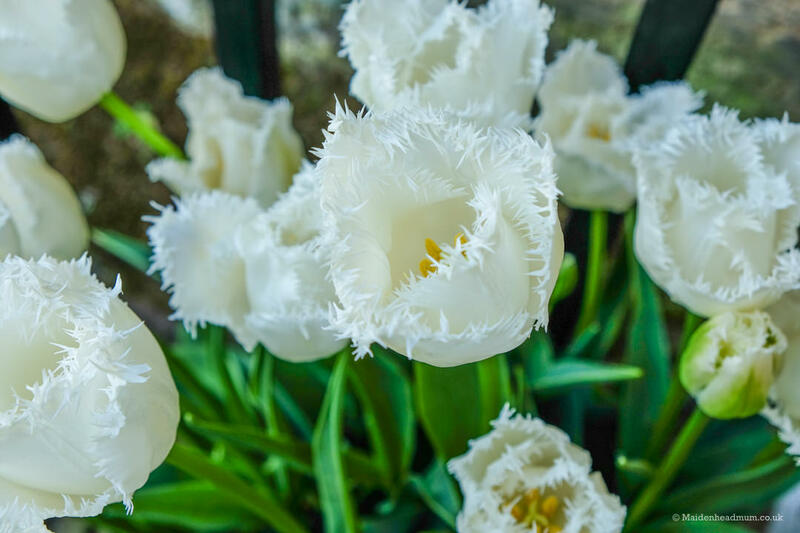 In the White Garden of the chapel there were lots of white tulips that had been planted. We found the gardens were pretty buggy friendly. Inside the chapel in the gardens. 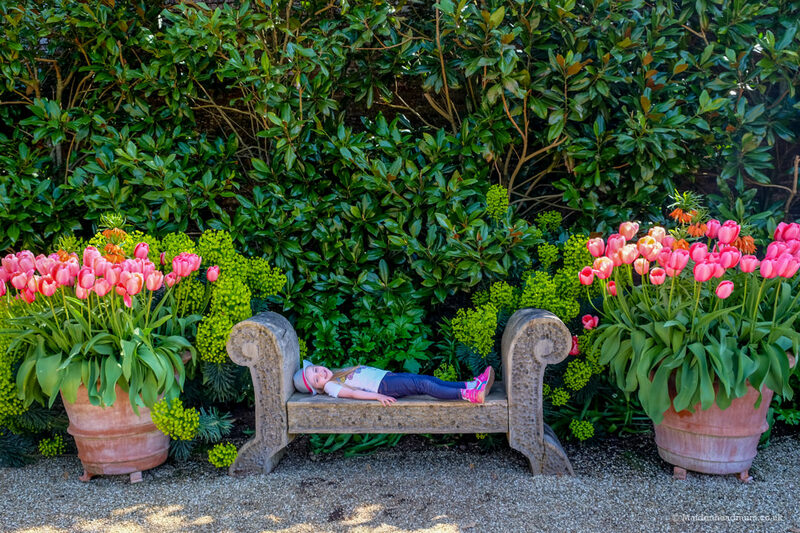 Not only were the gardens beautiful and photogenic, but they also offered a child-friendly place for my children to explore. 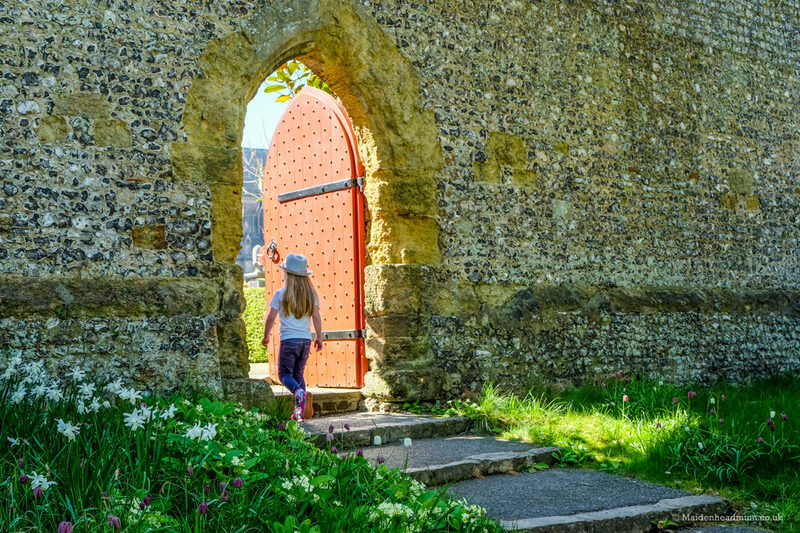 I felt safe letting them walk around, exploring different paths and opening doors into walled gardens. 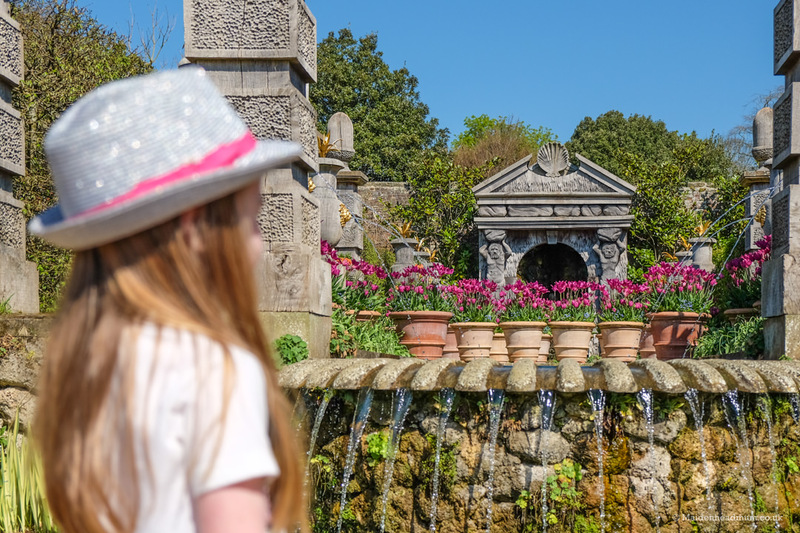 Of particular note is the ‘Collector Earl’s Garden’ which is a formal garden with fountains, gateways and pavilions that was opened by HRH The Prince of Wales in 2008. 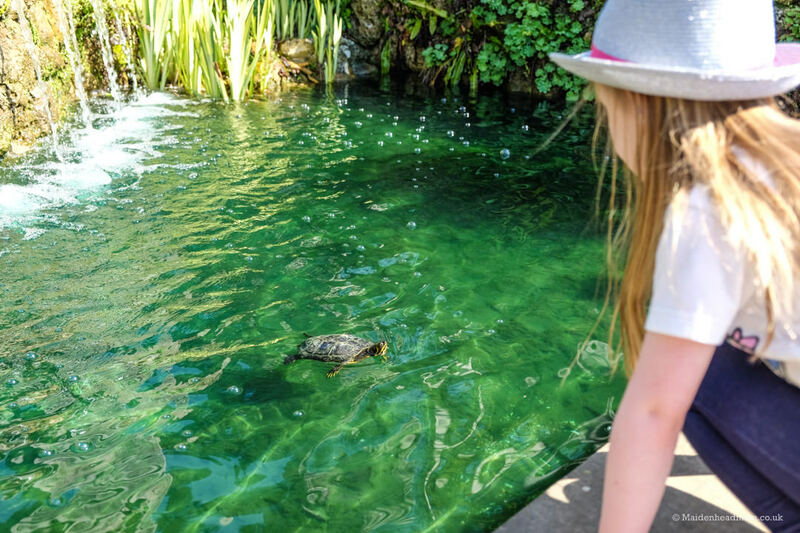 My two particularly liked the mini terrapins that they could see in the fountains and peeking into the summer houses and features around the garden. The fountains are a lovely focal point in the garden. Although we kept a firm hold of the toddler here! Much excitement to see the terrapins! 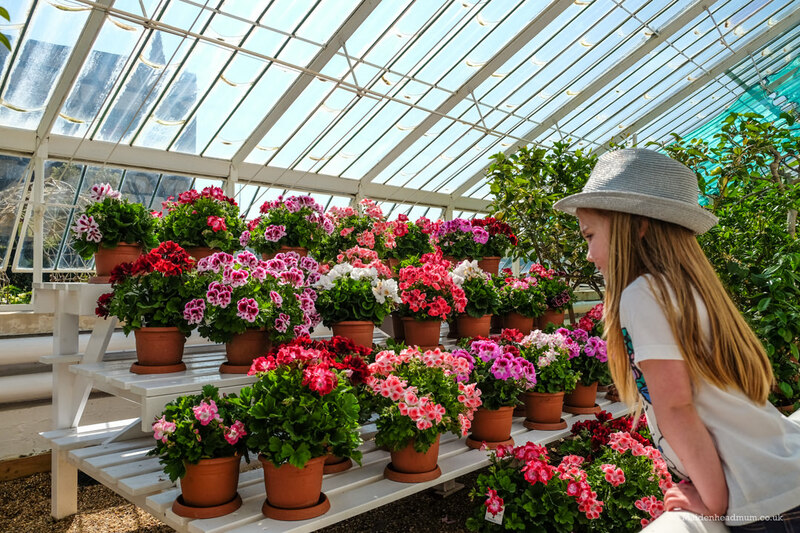 There are also glass houses with tropical flowers and fruits, a cut flower garden, a rose garden, a kitchen garden and white flower garden. And then on top of all of that, if you visit during April or May you can see the Tulip Festival. I got a bit emotional in the greenhouse. It reminded me of my nan who passed away last year. She was such a keen gardener, it would have blown her mind! 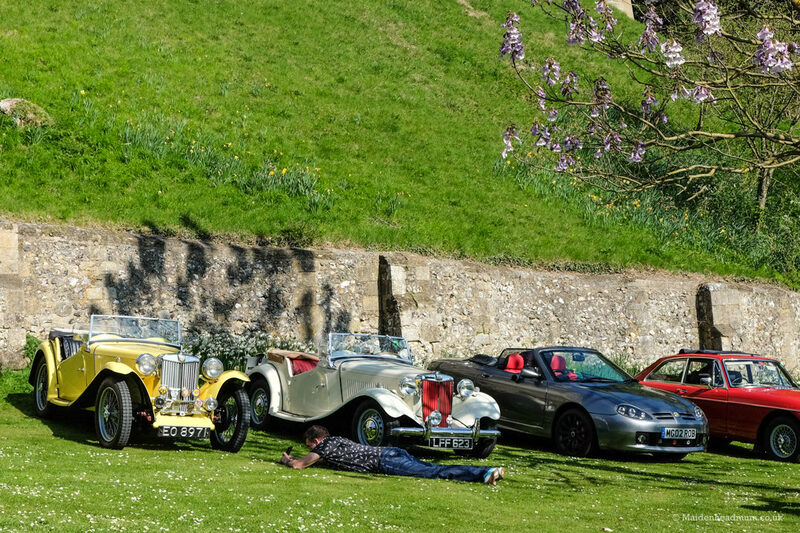 We arrived in time to see hundreds of classic MGs enter Arundel Castle for an owners meet up. It was quite a sight! I wasn’t really sure what to expect at a Tulip Festival. The last festival I had been to was a rather wet and muddy Glastonbury many, many years ago in a time before children so I wasn’t quite sure what I would make of it. I was also unsure if it would just be heaving with people and a challenge with the kids. The reality was so different to any of my fears: I’m so glad that we went! 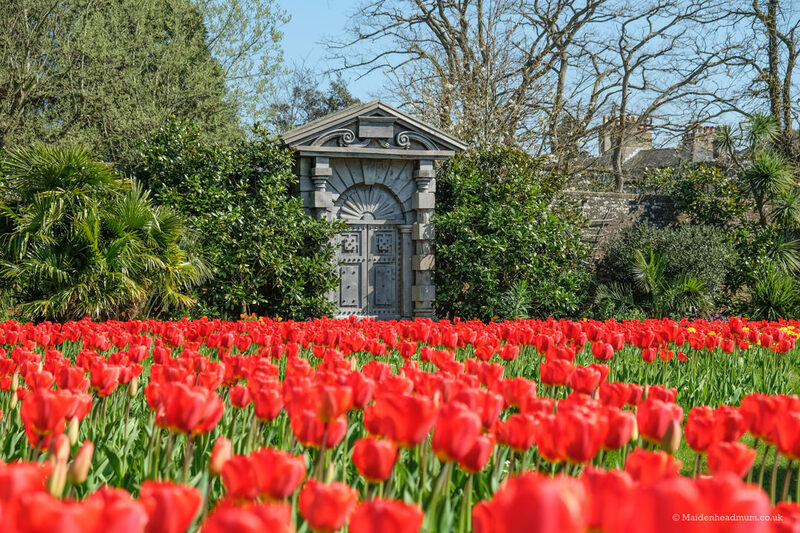 A striking sea of red tulips in the main labyrinth feature. My husband enjoyed seeing all of the classic cars. I love that he is lying on the ground to get his photo! 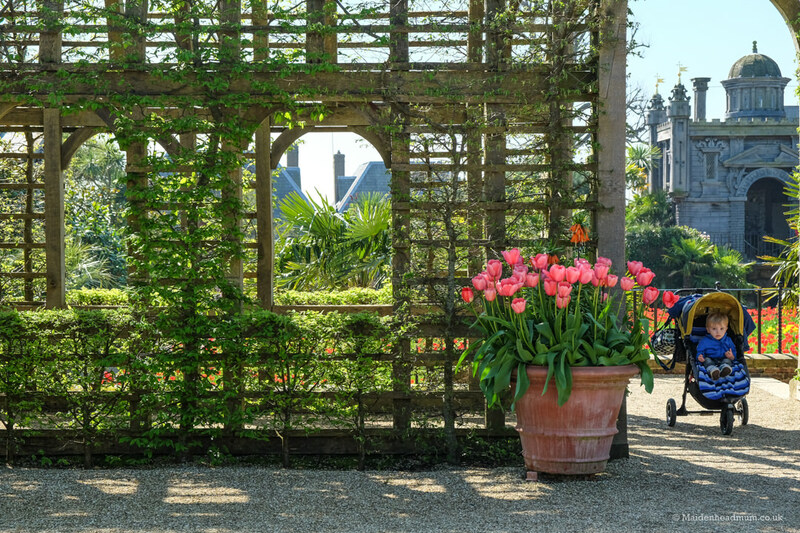 The tulips are on display in several areas around the castle, and you can walk around and take photos at your own pace. There was the main display area in front of Arundel Cathedral called the ‘labyrinth’ which looked fabulous from every angle. I couldn’t stop taking photos! You’ll be in Instagram heaven for sure. 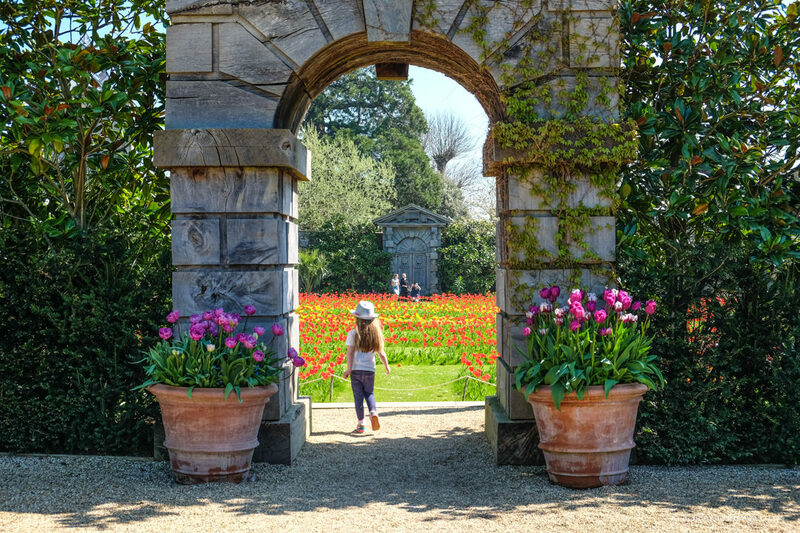 This area is cordoned off from public access to help protect the tulips (my children were instructed to ‘look but don’t touch’), but that didn’t impact on enjoyment at all. 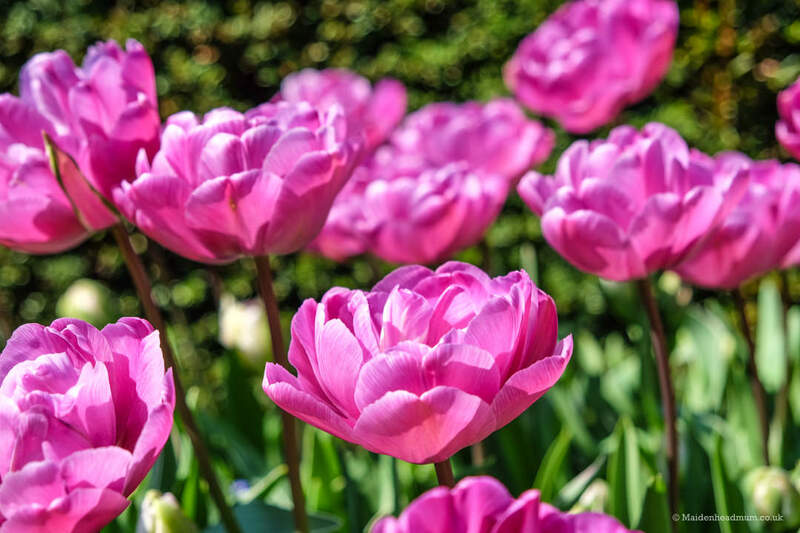 The 2018 exhibit promises to be even bigger than when we went in 2017, which is pretty impressive as there were thousands of tulips last year. 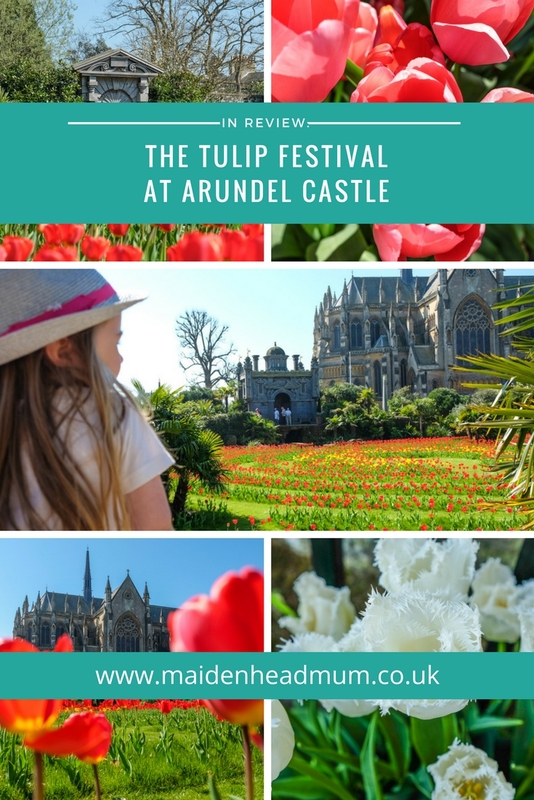 In 2018, Arundel Castle is celebrating 950 years of its initial construction, and the Tulip Festival will have over 60,000 tulips around the castle gardens, with another feature of 12,000 red tulips in the labyrinth. Wow. Imagine how long it takes to plant all of those! 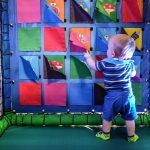 I loved taking photos while my daughter explored. 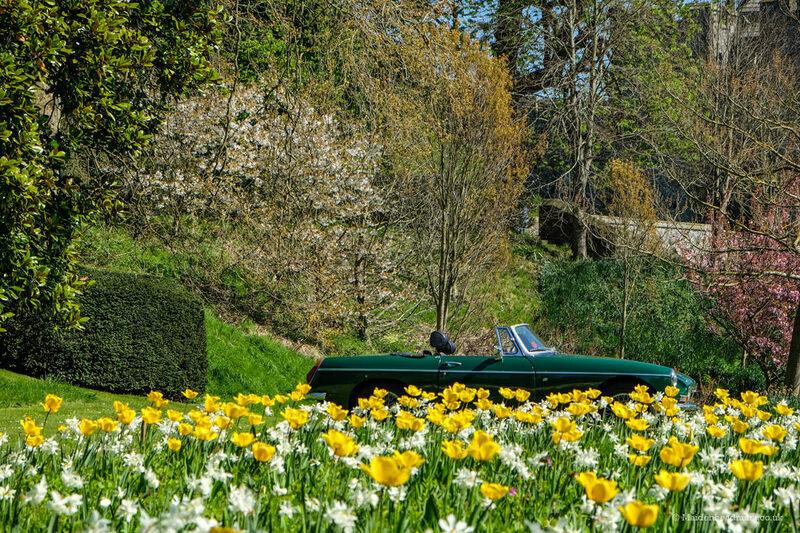 An MG hiding amongst the tulips! There is a lovely restaurant and café in the main castle, but it can get really busy at peak times. 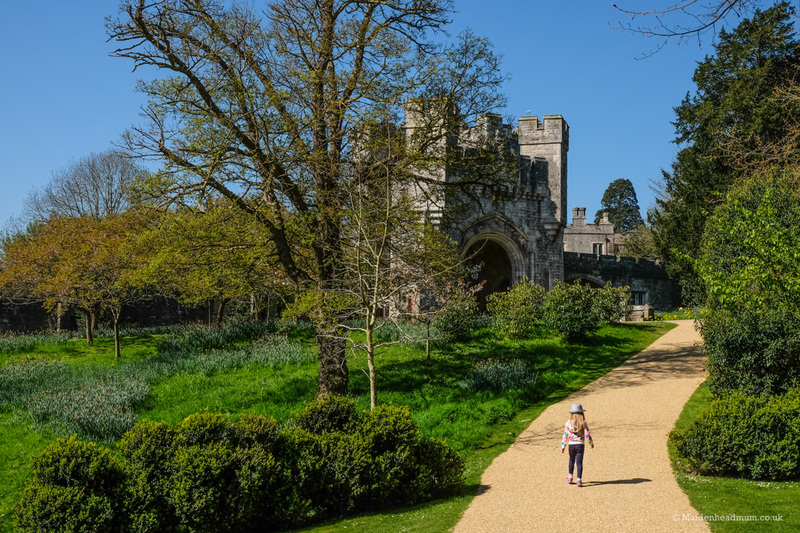 We also find that everyone in the family is starving at 11 am, so we were pleased to see that there were lots of benches dotted around the castle grounds which were perfect for a quick picnic stop. My daughter and I then had a sneaky slice of cake from the café while her brother was napping in the buggy with his Dad. Throughout the year there are additional events at the castle. When we visited there was a meet up for MG car owners, and there were some medieval re-enactments taking place throughout the day. Plenty to keep everyone in the family happy. 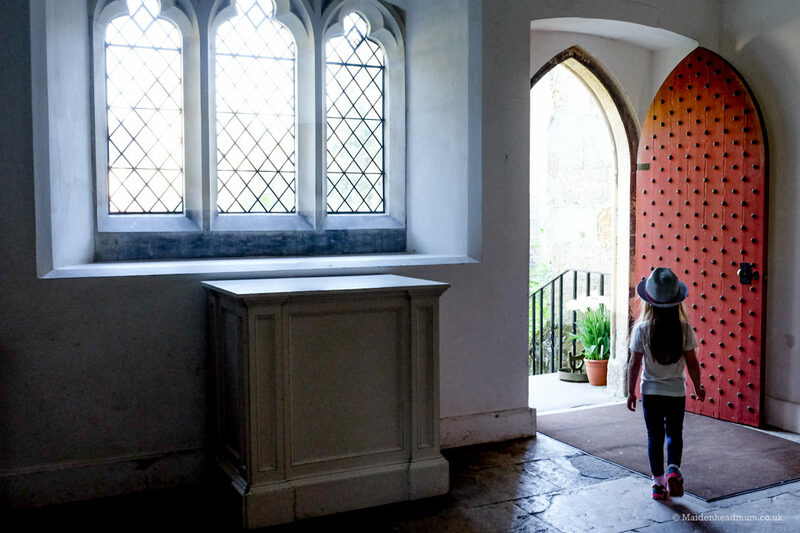 The castle has set opening times: it’s open to the public from Tuesday to Sunday from the 30th March 2018, up until the 28th October. The grounds open at 10 and the castle rooms open at 12. 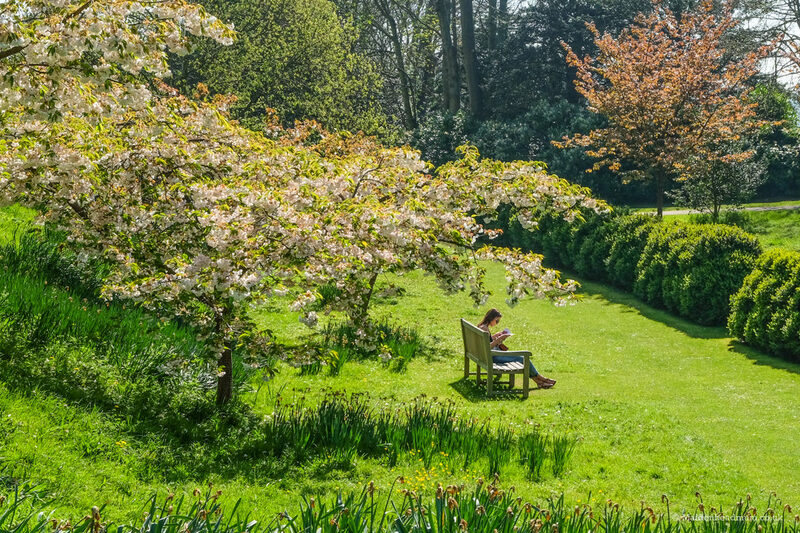 Now, this might seem like a step too far, but the grounds are so beautiful that you’ll find yourself wanting to take a lot of photos. You might even want to be in a few yourself! My daughter had a flowery t-shirt on, but when we revisit, I’m going to look for a bright dress that will contrast well with the tulips. Whatever colour I choose for her dress I will see if I can get her brother wearing a similar colour too. It’s the little things that can really make a photo. I found it a little confusing trying to figure out what we wanted to visit and there are multiple ticket options. 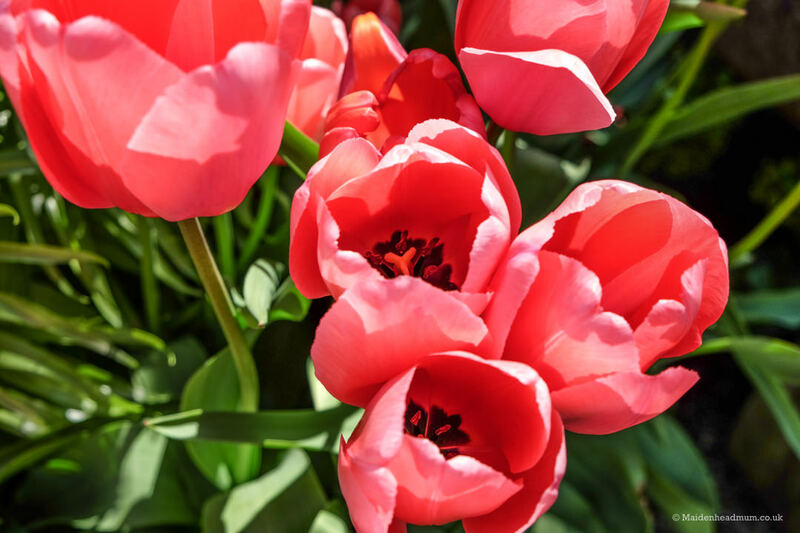 The Tulip Festival is included in your admission, and you will be able to see this as you walk around the grounds. You can choose to go inside the castle, but this is only after midday as the family still live there. There are two options for seeing inside the castle: either ‘Gold’ or ‘Gold Plus’ to access the bedrooms. 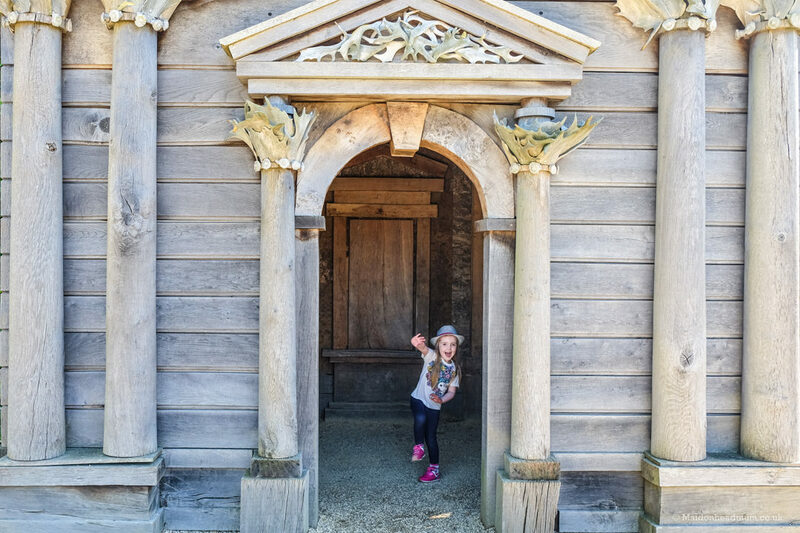 We decided to go with a ‘Gold Plus’ family ticket, although I should mention that visiting the inside of the castle was better suited for my daughter as opposed to her younger brother. 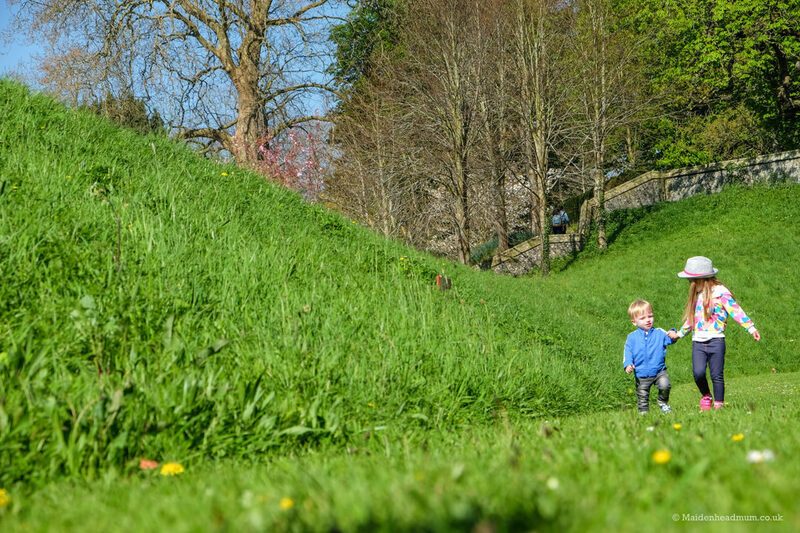 A free range toddler with a tiny attention span isn’t really the best idea in a stately home! 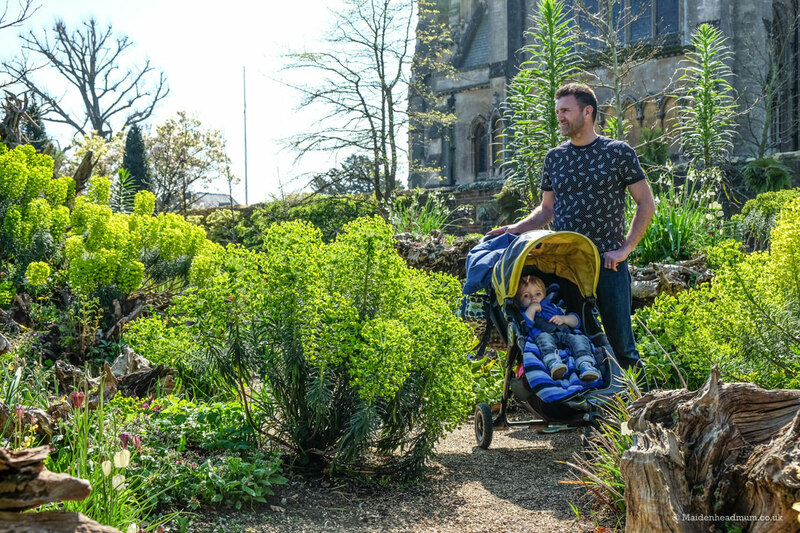 Instead, he enjoyed running around the grounds and climbing up and down in the older parts of the castle, and the little man eventually napped while I took photos in other parts of the gardens. This goes for all members of the family as not all areas of the castle are accessible with a buggy. 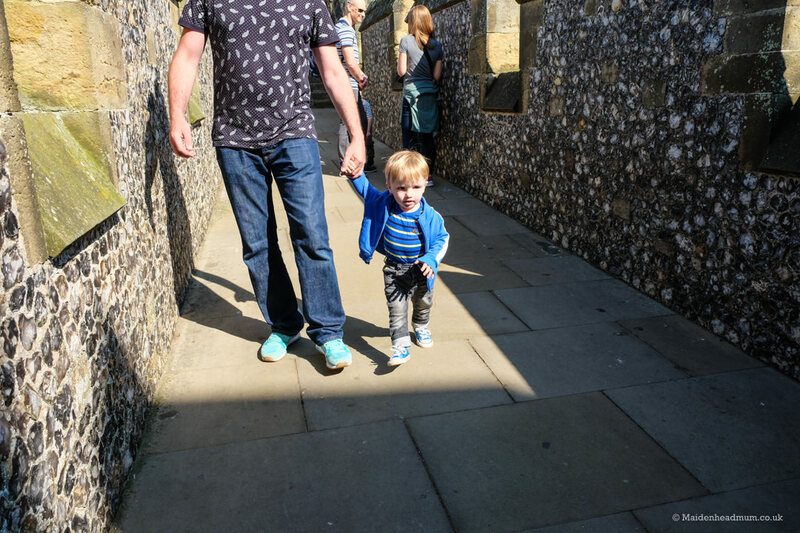 You can choose to leave the pushchair in the buggy park and climb the 131 steps to the top of the Norman Keep, which has amazing views out from the top. Little feet can get tired easily so you might end up carrying someone all the way down!